Irish wolfhounds, the tallest dog breed in the world, were originally bred to pull men off horses and chariots in battle. Nowadays this breed is a popular family companion with owners taking advantage of the breeds intelligence for use in hunting and obedience competitions. Despite the breed's original purpose, they are considered a gentle giant and are overly friendly towards everyone. Irish wolfhounds do well with children and are friendly with other animals. Their friendly behavior makes them poor guard dogs, but their size generally intimidates any potential intruders before they realize the dog only want to play. 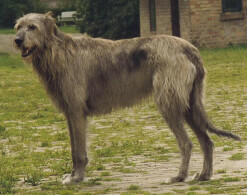 Irish Wolfhounds are quite similar to greyhounds and are in the hound category. The utilize their keen sense of sight along with their speed and imposing size to take down large game such as wolf and elk. They also enjoy running, are capable of doing so at high speeds and are often used for coursing small game as well. Contrary to what their giant size and shaggy coat may lead you to believe, these dogs are gentle giants. Irish Wolfhound attacks are virtually unheard of considering they are kind and gentle (although quiet and reserved) and are notoriously poor guard and watch dogs. You don't have to be a family of athletes to own one of these dogs, just make sure you have plenty of room for them as well as plenty of time to spend with them each day. Consider the following Irish Wolfhound facts and information so you are aware of the benefits and potential problems of owning one. The Irish wolfhound's size is almost comical as they can easily put their paws on an adult's shoulders and stand taller than their owner. Males can easily reach 36 inches from ground to shoulder and weigh as much as 180 pounds. If you're concerned about your dog getting too big, then this giant breed is not the best choice. Irish wolfhounds have a very strong desire to be with their human family. This should be taken into consideration before adopting the breed as family is his main priority. Although the breed's gigantic size is intimidating to most people, the Irish wolfhound is not an aggressive dog and is fairly calm. The breed is gentle with children, but should be monitored since their large size can easily knock over children (and sometimes even adults). Irish wolfhounds do best with other animals, although they may chase small dogs and cats so it's recommended to socialize them with other animals at a young age. Irish wolfhounds rarely need baths and a bath twice a year will suffice (unless their coat develops an odor). The breed does shed throughout the year, but brushing the coat weekly will help prevent excess hair from falling out uncontrollably. Even though Irish wolfhounds are enormous dogs, they are a house dog at heart. They are very calm indoors and only need moderate exercise to meet their energy needs. Irish Wolfhound history is believed to go back as far as 9,000 years to 7000 B.C. Other theories state that the breed was introduced to the British Isles around 3000 B.C. when Phoenicians sailed in for trading and their sighthounds were crossed with regional mastiffs. 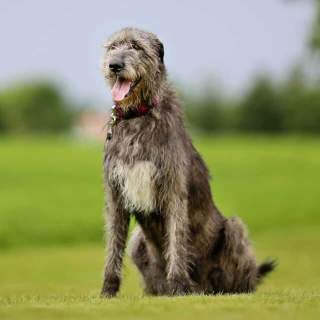 While the jury is out on the actual Irish wolfhound origin, there is far more solid evidence that the dogs were present in the Isles around 270 B.C. At that time, they were apparently used on the continent for war. When Celts sacked Delphi, the men had the dogs alongside them to fight. A century later, these accounts were noted by Julius Caesar when he penned a treatise called The Gallic Wars. In the 5th century A.D., Irish laws and literature made mention of the dogs as "cú," which can be translated as "hound" or "wolf dog." In time, these dogs were trained for hunting and as guard dogs. The term "Cu" became a prefix that was bestowed upon warriors and kings who were to be respected, and the myth of Cúchulain reflects this. The Irish hero of the Ulster Cycle tales slew the hound of Culain and then took up the position of guarding the house that the formerly fearsome dog previously protected. During the Tudor conquest of Ireland in the 1500s, the Irish Wolfhounds were legally owned only by nobility. A description of the breed can be found in the 1571 book titled Historie of Ireland by Saint Edmund Campion. 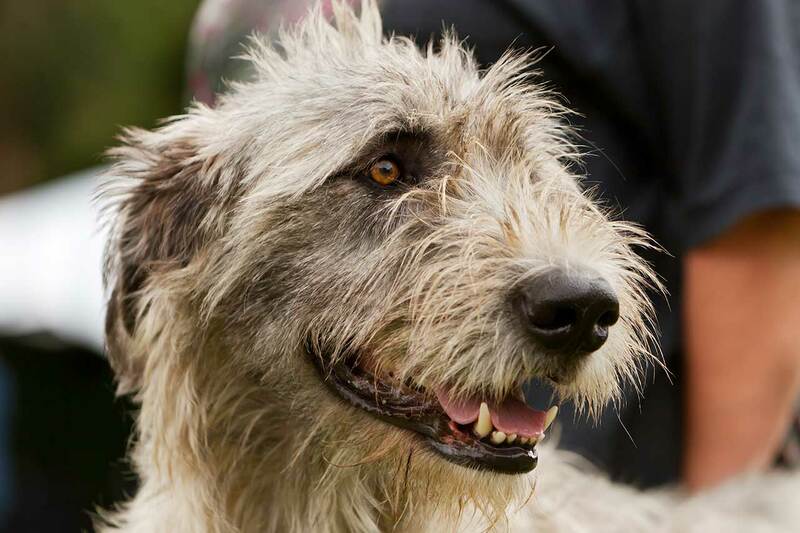 In 1652, Oliver Cromwell made a declaration meant to protect the number of Irish Wolfhounds. In the 18th century, the Wolfhounds had become scarce. In his 1790 book A General History of Quadrupeds, Bewick writes that they are the biggest and most beautiful dogs of all known dog breeds. In 1796, was when the allegedly last wolf in Ireland was killed. The dogs thereafter were used less as hunters than as status symbols. The Irish Wolfhound is almost always left in his/her natural state, especially if the dog is to be in shows. No clipping or trimming is necessary and is, in fact, discouraged as the coat is a major asset to these dogs because this breed's appearance correlates with it's functionality. They appear very much like a larger, stockier and hairier greyhound. They are able to take down large game such as wolf or elk or can course small game at relatively high speeds. Overall, they are longer than tall with a long neck and muscular but narrow limbs leading into large feet. The Irish Wolfhound's medium length double coat is wiry and rough to protect them against brush and cold, wet climates; it can be seen in many different colors including black, white, grey, brindle, fawn, wheaten, red and more. 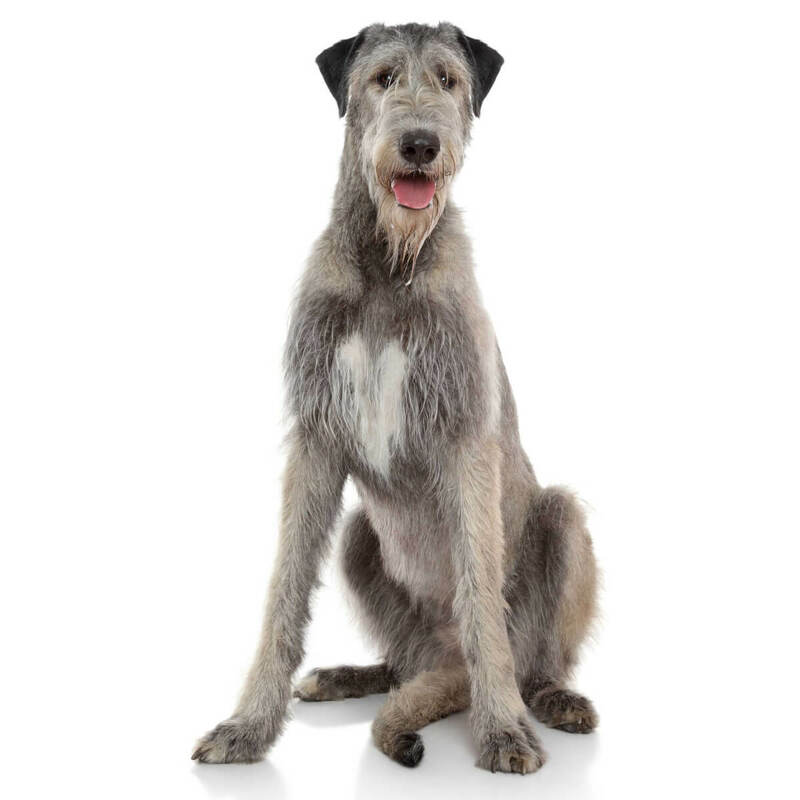 Even longer is the beard which adds character to the long face and muzzle and the brow hair that sometimes obscures the Irish Wolfhound's piercing round eyes. Other notable characteristics akin to the greyhound include small ears carried low and back and a long tail also carried low. 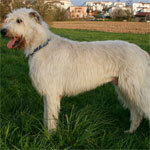 Black or White Irish Wolfhounds are the most popular coat colors, followed by red. Black, grey or white are acceptable colors for the Irish Wolfhound's markings. Most dog enthusiasts wonder "How big/tall will a fully grown Irish Wolfhound get?". The answer to that is "huge, giant, probably bigger than any dog you've ever seen". Irish Wolfhound size category is undeniably very large. These gentle giants are one of the biggest dog breeds and individuals routinely win competitions for the "tallest dog" title, however, they are not the heaviest breed. Remember these are the minimum guidelines so you have to anticipate and be able to provide space for a 7 ft tall, 150 pound behemoth if necessary! 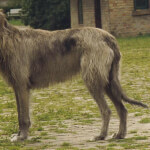 Some of the biggest dogs in the world, Irish Wolfhounds are often described as "giant" or "huge". The largest Irish Wolfhounds usually win "tallest dog" contests around the globe; the tallest Irish Wolfhounds can reach up to 7 feet! Males should be a minimum of 32 inches at the shoulder, females 30 inches and both sexes easily clear the 100 pound mark with males upwards of 120 pounds. As you can see, even the runt of the litter will be a very large dog so there are no "small" Irish Wolfhounds. Some breeders may advertise Miniature Irish Wolfhounds but beware, small Irish Wolfhounds bred together to create smaller and smaller litter can greatly increase the likelihood of health problems. More likely the breeder has bred an Irish Wolfhound with a smaller breed of dog with similar build-- which means it is no longer an Irish Wolfhound. 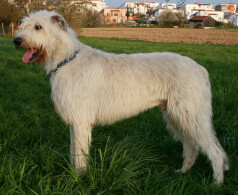 As of now there are no purebred Irish Wolfhounds with short hair (unless it is a rare genetic mutation). There are also no toy or teacup Irish Wolfhounds and trying to produce such is impossible without the introduction of other small breeds to the gene pool. The Irish Wolfhound temperament is truly superb. Their most notable characteristics include: calm, gentle, patient, dignified, affectionate and intelligent. They are quiet yet loving and companionable indoors and are introverted and reserved around strangers; some may even be friendly towards strangers but one thing is for sure--they are not aggressive. If extreme circumstances call upon them to be protective of the owner, especially during a hunt, they can be but this is by no means a guard or watch dog. Although most owners agree they are easily trained many retain an independent style thinking that calls for a firm, consistent owner. They can be left alone for reasonable amounts of time daily but may become destructive if left alone frequently for long periods-- a huge nuisance is not something the average owner can handle. 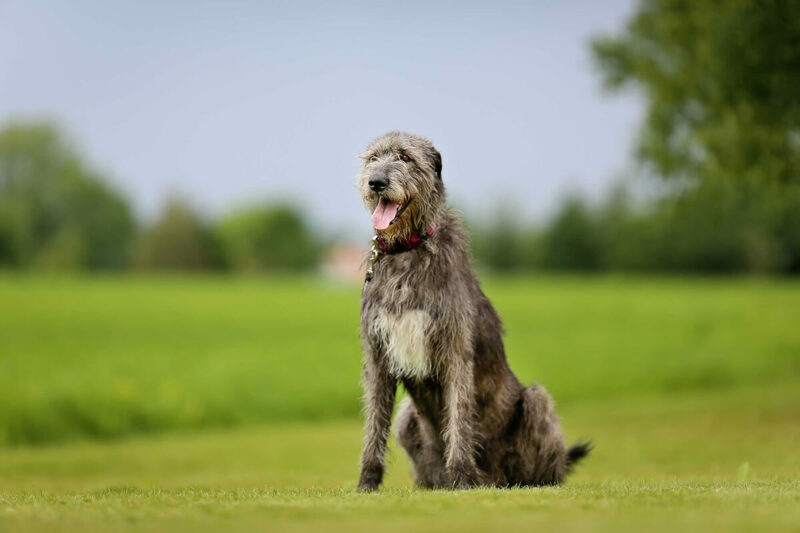 The Irish Wolfhound personality loosens up when let outdoors where they can run freely; they aren't high energy dogs so a little outdoor playtime will go a long way. They also enjoy playing with other dogs and they will bond especially well with ones in their household. 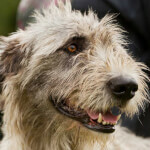 Irish Wolfhounds are good family dogs and will form deep, affectionate bonds with their owners. They are calm inside the household and are patient with children. Supervision is still mandatory with small kids, however, this is not due to any aggression but only because the sheer size of such a large dog can pose a hazard. The swipe of a huge tail can knock an unsteady toddler to the ground quite easily. The breed is an excellent choice for families that are have an average activity level and school/work schedules since you can leave them at home without worry the house is being destroyed. Irish Wolfhounds are said to live very peacefully with other pets and may even form attachments to other dogs they are raised with. Socialization from puppyhood (or as early as possible) is recommended for all pets to get them used to being around other animals without experiencing fear or aggression. Irish Wolfhounds are also said to do fine with cats and other non canine pets due to their laid back natures. 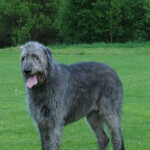 Below are pictures of the Irish Wolfhound dog breed. Quiet, companionable and gentle, Irish Wolfhounds as pets are very pleasant to have around the house. Although they thrive on affection and companionship from their owners each day, they can be left alone for reasonable amounts of time during school and work. They are not known for excessive barking, howling or separation anxiety and are typically friendly with strangers; they can be reserved but not aggressive which makes them poor guardians but excellent for multiple family dwellings like condos, duplexes and homes built closely together. Keep in mind that space is a determining factor whether the breed is right for you. They may only be medium energy level dogs but a small apartment just will not due for them to have enough room to stretch their legs. Also, the breed is much better suited to cold temperatures than hot. 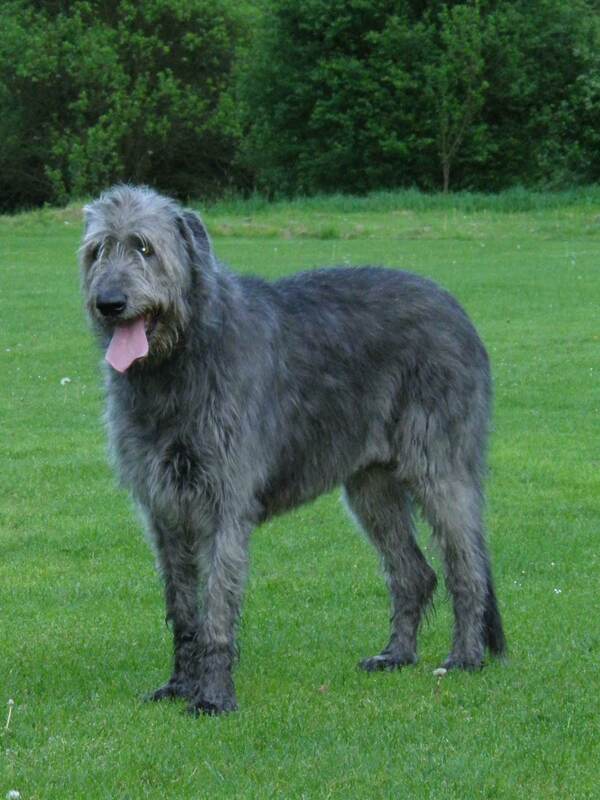 The Irish Wolfhound is not hypoallergenic but the coat also doesn't shed. This characteristic requires frequent brushing and twice per year stripping of the coat-- which is best done by a professional. Due to the likelihood you will need professional grooming, the cost of feeding such a large dog, and the likelihood of health issues, owning an Irish Wolfhound can be expensive. Due to laundry list of health conditions that can be inherited we recommend not skipping any veterinary exams, even if you puppy seems healthy. Your vet know procedures that can help detect and even prevent most of the health issues on this list.